Slowly and ominously, the war drums started beating in America last week. The media warmed up with news of Donald Trump telling congressmen he was considering retaliation for the chemical attack in Khan Sheikhoun, Syria. The pace picked up when Hillary Clinton told the ‘Women in the World Summit’ that America should “take out Assad’s air fields”. Aside from the fact that Williams was woefully misusing the song – which is a typical Cohen condensation of love and rebellion resistant to one interpretation – his description of a cruise missile launch as “beautiful” was nauseously disturbing. One might be open to the idea of violence as art in a Bosch painting or a Francis Coppola movie. But this was real life, real weapons, real death and real war on display. Suddenly, the actions of a president previously dismissed as ignorant and dangerous were being called “swift”, “decisive” and “just”. The sarcasm of many liberal news outlets took on more sombre notes. After all, in times of war, a nation must rally around its commander-in-chief right? The general makes it all sound so proper that you’d think those people were lucky to be disintegrated by men of such honour. 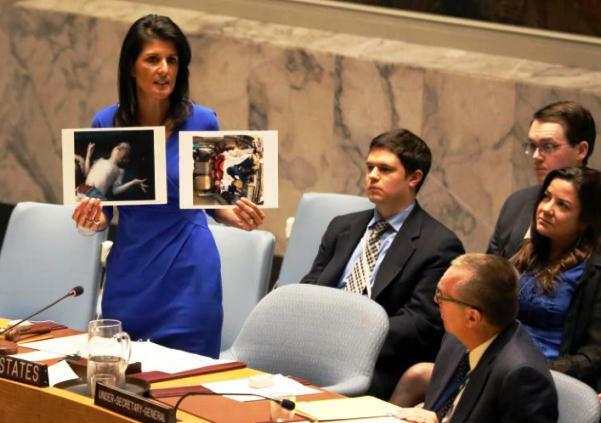 Last week, US Ambassador to the UN, Nikki Haley made a fiery speech against Assad and Russia, including in her presentation graphic photos of dead Syrian children. Well, I wonder when she’ll be showing us some from Mosul. So once again, Americans are being prepared for war. At this point, no one knows whether the American administration will increase troop presence or attempt a regime change by force. Going by the willingness of both conservative and liberal media to support the missile strikes though, if Trump did so, it would be with popular backing and a high approval rating. The saddest aspect of this is how unsurprising it is. After fictional weapons of mass destruction (WMDs) in Iraq, the “liberation” of Libya from Gaddafi and the arming of “moderate rebels” in Syria, it is plain as day that the truth is whatever the media wants it to be. This is not to suggest that any of this is a simple matter. 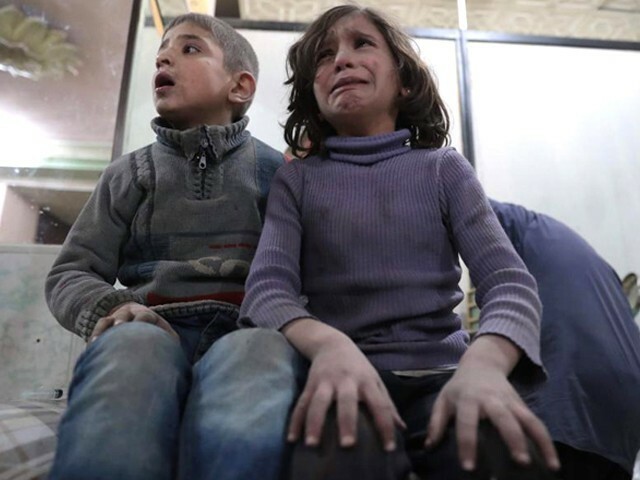 The world has watched with horror as the Syrian catastrophe has unfolded. Bashar al-Assad must be held responsible for the mass murder of his own people. 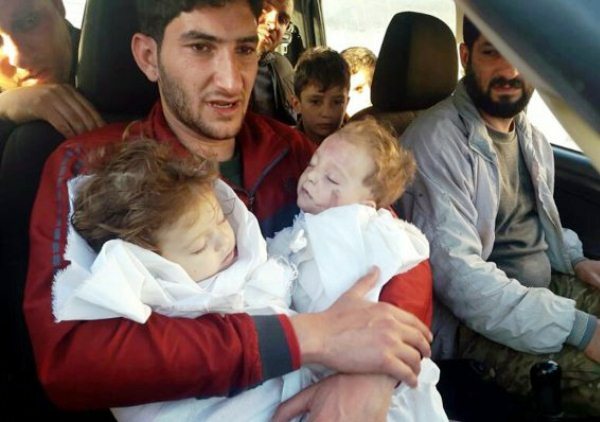 Who is it that was not moved to tears by the images of Abdul Hamed Youssef embracing his two dead children and mourning their mother? Who can dare to step into the shoes of those for whom apocalypse has already arrived? But the question is this, has a man who spent his election campaign demonising Syrian refugees and tried twice to ban them from the United States suddenly become a saviour? The road to hell, as the saying goes, is paved with good intentions. For the US to step into the fray without any international consensus and no real diplomacy or political running parallel to military action would be disastrous. So here we are. What began as an uprising against a brutal dictator has been usurped by the two most powerful nations on earth. Like Afghanistan in 1979, each Syrian side has a superpower behind it. None of this, of course, is being decided by the people of Syria. And then, to those who are clamouring about this being the beginning of World War III – if it has not become apparent now that the modus operandi of the powerful is not to engage each other in mortal combat; it is to select their racehorse and place their bets. Since World War II, superpowers have ceased to face off in direct warfare. Like the rest of their dirty work, they have outsourced it to the third world. Here’s a prediction – there will be no war between Russia and America in Syria, or anywhere else for that matter. What will instead commence is a systematic destruction of yet another Muslim majority nation. We will continue to be voyeurs to the danse macabre the military-industrial complex is choreographing on the graves of Syrian children. The sanguineous game of chess goes: Kabul, Baghdad, Fallujah, Aleppo, Mosul, and perhaps soon to come, Damascus. For Syrians, it is Armageddon. For Raytheon, Lockheed Martin, Thales, Boeing, Almaz-Antey, United Aircraft and their benefactors, it is harvest time. 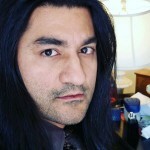 What do we have left once we abandon the lie? Chaos. A gaping pit waiting to swallow us all. For a start, all can search Wikipedia for “Use of Chemical Weapons in Syrian Civil War”, and “List of Syrian Civil War barrel bomb attacks” to understand how Team Assad deliberately targets civilians! For insight into this slaughter of civilians! All can go to Wikipedia and search for “Use of Chemical Weapons in Syrian Civil War”!